People have always experienced fear, and always will, says the Rev. Adam Hamilton. It’s part of who we are and how we are wired. In many ways, fear is even a good thing that warns us of potential dangers. But sometimes, our fears may be based on false information and threats that are not real. And even when fears are valid, people need healthy ways to face them, Hamilton said. “We need to be able to tamp down our fears and get a handle on them,” he said. 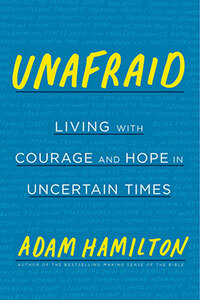 In his new book, “Unafraid: Living with Courage and Hope in Uncertain Times,” Hamilton draws upon research, stories and Scripture to examine the nature of fear and anxiety today and how people can learn to face them. Hamilton spoke recently with Faith & Leadership about the book. The following is an edited transcript. Q: To start, why a book about fear? The idea came in 2016, watching fear rise during the presidential election and how politicians pressed the fear button regularly. It was in radio and television spots, with scary voices pointing out all the horrible things that would happen if someone’s opponent was elected. That happened at state levels, but also in the presidential race -- fear of Muslims, fear of immigrants, fear of the other party. So many fears were being escalated. I felt it in my people [at church]. And polls showed that Americans were more fearful than at any time since just after 9/11. That planted the seed that I needed to preach about fear. Then I talked with a man who had been experiencing panic attacks related to a job change, and he told me I ought to write a book about fear. I began to think that this was a much deeper and more pervasive problem than I had realized. Pastors preach on fear regularly. The Bible has over 400 references to fear or terror and 140 references to “Don’t be afraid.” Fear is a major issue in the Bible. So I thought I’d like to do a deep dive into it. I began with a sermon series in January 2017, which gave me a chance to do some research. We did a survey of our congregation in December 2016 to see what people were afraid of. We listed 24 possible fears and also left it open-ended. That gave us a chance to see how people dealt with fear, and what they were afraid of, and out of that came the sermon series and then the book. Q: Tell us about the survey. What did you find? About 2,400 people took the survey. We found that younger adults were actually more fearful than older adults, which was a surprise to me. Of the 18- to 35-year-olds, 43 percent had moderate levels of fear, and 45 percent had significant levels of fear -- the highest “significant level” of any of the age groups. Those who were 36 to 50 years old were roughly the same -- 45 percent had moderate levels of fear, and 44 percent, significant levels of fear. For those 51 to 65 years old, 31 percent reported significant levels of fear. For 66- to 74-year-olds, 23 percent had significant levels of fear, and those over 75, 21 percent. That’s still one in five, but it’s less than half of the percentage of young adults with significant fear. As you age, you get a sense of wisdom and perspective that tells you that it’s probably going to be OK. Whereas when you’re younger, threats seem greater, and we’re not certain that we are going to live through them and be OK.
We also found that people’s fears changed significantly. What people under 50 feared was different from what people over 50 feared. For those under 50, the No. 1 fear was personal failure, followed by disappointing others, uncertainty about the future, financial difficulties and the death of a loved one. For those over 50, the No. 1 fear was the direction of our country. The second was finances for retirement, followed by fear of aging, loss of mental capacity and fear of dependency upon others. Many of these were fears around aging. For younger people, they were fears about their future and about what might happen in their lives. Q: Isn’t the present always and inherently a moment of fear for any people at any time? Fear is always with us, which is why we see references to it in biblical times. There’s always a measure of fear, partly because of how we’re designed as human beings. We have this wonderful capacity to sense threat, and as we do, our body responds. Our eyes, ears, sense of smell, taste, touch, and internal senses and organs were all designed by God to protect us and keep us safe. We’re all familiar with the fight-or-flight mechanism. The amygdala in our brain takes information from our senses and discerns very quickly if something might be a threat, and it heightens our awareness by triggering a cascade of hormones that make our muscles tense, our breathing get shallow, our heart beat faster, our pupils dilate, and a whole host of other things, to prepare us, to protect us. It’s hardwired into us. The brain also has the capacity to imagine possible threats. It’s designed to remember things that were painful in the past and to avoid them in the future, but also to imagine possible threats that we’ve never experienced. So at a cognitive level, at a subconscious level, and then at a physiological level, we are wired to protect ourselves, and that’s a good gift. But the challenge is that we can have bad information that leads us to be afraid. We can have false alarms that trigger our amygdala to say there’s a threat when in fact there’s not. So we need to be able to tamp down our fears and get a handle on them. What I try to address in the book is both the fears that may not be accurate fears and also things that could be legitimate fears, exploring how to address them in a way that’s healthy and helpful. In the book, I look at four steps, going back to the Bible and earlier, that people have used to address their fears, and what the Scripture teaches us. They’re things that actually help us in dealing with and living through our fears with courage and hope. We’ll never eliminate fear from our lives, and we don’t want to. It’s a necessary part of our lives, but we can live with courage and hope despite our fears. Q: So what are we to do? How do we face our fears? In the book, I give an acronym -- FEAR -- to help people remember the four steps. The first is Face your fears -- lean into them and face them with a bias of hope. Instead of running away, we can step toward our fear. As we do, we find what therapists call an extinction of our fears. As an example from childhood, maybe we’re terrified to jump off a high dive. But little by little, as we go back up again and again, and eventually if we jump, we realize, “I survived,” and the fear dissipates. We extinguish the fear by stepping toward it. This is true in many areas we’re afraid of, like public speaking. We test the waters. We speak in front of a small group and then a little larger group. And eventually, we realize it’s not quite as scary as we thought. In essence, you’re training your mind not to be afraid. Each step you take toward it reinforces that you don’t have to be afraid. The second step -- the E in the FEAR acronym -- is Examine your assumptions in the light of the facts. When we examine our assumptions, we get information. For example, a common fear in America today is the fear of crime. We have near-record levels of fear about crime and violence. But if you examine your assumptions in the light of the facts, if you go online and look at the data, you’ll find that violent crime is down by nearly half since the late ’80s and early ’90s, and the murder rate is at its lowest level since 1964. We’re afraid because we hear 24-hour news cycles telling us about violent crimes in various places, but we can’t put that in perspective with the fact that 330 million people live in our country. The A in FEAR is Attack your anxiety with action. Fear is almost always meant to produce an action in us. We’re meant to do something as a result of our fear, so if we have a legitimate fear, doing nothing leaves us fearful. The moment we start taking action toward our fears, they begin to dissipate, because our fears were meant to move us. The R in the FEAR acronym is Release your cares to God. Long before Xanax and Zoloft, people had prayer, meditation and trust in God. Over 140 times in the Scripture, we’re told not to be afraid, and almost always the reason is because God is with us. We can cultivate this awareness of God’s presence through spiritual disciplines -- reading Scripture, lectio divina, prayer. We can do a host of things to make ourselves aware of the presence of God. We use our imagination to imagine possible threats and negative outcomes. But we can use the same power of imagination to imagine that God is with us. It’s the same technique. It’s the same energy and the same mental work to imagine the worst outcome as to imagine there’s a God who’s walking with us no matter what happens. Sometimes, people think, “Well, if you’re using your imagination, are you saying you’re making up the idea of God?” The answer is no, of course not, but you are using the skills that God gave you in your brain to picture that what the Scripture says is always true. Those four techniques give us the capacity to live with courage and hope despite our fears. Q: Do certain forces today cultivate fear in our culture? I’ve read before that much advertising plays upon our fears. And as you’ve said, it plays a role in our politics. Fear is a primal feeling that every human being wrestles with, so it’s easy to understand why advertisers, politicians, research scientists raising money for their causes, a whole host of folks are going to capitalize on fear. It’s not always that they have bad intentions. But it’s an issue. The bottom line is we’re wired to protect ourselves, and if somebody can show us that something is a threat and they have a better solution, that’s a huge motivator for us to vote for them or to buy their products. One of our fundamental drives is to keep ourselves safe. But if we live our lives playing it safe, we’ll miss out on many of life’s most important experiences. Almost everything we do that has the greatest impact on the world or the most reward requires taking risks. To get married is a risk. I was terrified the night before I got married. I had something like a panic attack, thinking, “What are you doing?” And 36 years later, how grateful I am that I took the risk and got married. I was scared to death the night before our first worship service. I was 25. What did I know? But somehow, had I not taken that risk, for the 22,000 people who are now part of the church, their lives would be different. Q: I wonder sometimes whether Christians aren’t some of the most fearful people in America today. Are there lessons here for the church as it faces a very uncertain future? That’s exactly right. Regardless of denomination, we’re seeing declines in worship attendance. We’re seeing declines in younger adults participating in worship. There’s a lot of handwringing. But the thing is, fear is meant, again, to be a motivating force. If I’m fearful, it’s meant to move me to action. Within the United Methodist Church, there is anxiety related to whether we will divide over the question of our ministry with gay and lesbian people. We will have a vote in 2019 that may or may not resolve the issue. If you look over the history of Methodism, we’ve had groups calve off from our church many times, and out of that came the Nazarenes, the Wesleyans, the Free Methodists, the AME, the AME Zion, the Pentecostal movement. A whole host of the Holiness churches came out of the Methodist movement, and somehow, it was OK. Somehow, the kingdom of God didn’t fall. Our churches survived, and we kept going forward. And this is what I tell my congregation. I don’t have a lot of folks wringing their hands at Church of the Resurrection about the future of the denomination. What I’ve said is that we’re United Methodists, and whatever that looks like in the future, we’re probably still going to be United Methodists.